Therefore, we must “put on” the armor of God; but first we must ask, what is this armor precisely? Are they actual spiritual pieces of armor that fit onto our spirits? Are they mere philosophical abstractions and allegories? 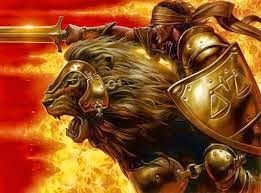 Or are they representations of spiritual truths that we obtain and employ spiritually in our warfare against the enemy? I find it interesting that the phrase “put on” in reference to the armor is likewise used elsewhere in this epistle (and in the scriptures) in the expression of putting on Christ, or putting on the new man (in conjunction with putting off the old man – thus there is a connection to the passage in Isaiah of ‘renewing’ or changing our strength, trading off the old man with his weaknesses and corruptions for the new man created in Christ Jesus (ISAIAH 40:31); being so empowered, we are able to conduct spiritual living, spiritual warfare and spiritual victory). But put ye on the Lord Jesus Christ, and make not provision for the flesh, to fulfill the lusts thereof. If I were to stand in opposition to Satan in battle, he would devastate me thoroughly; so much so, there wouldn’t be enough left of me to fill a thimble! I have neither the strength nor the power, being a mere mortal of human frailty and sin, to withstand him at all. I would be as vulnerable to his weapons of attack as a naked soldier would be to the lethally sharp blade of an enemy on the battle front! Yet, let that vulnerable soldier “put on” his armor, and he can indeed withstand the blows of his enemy’s sword, and engage him with a sword of his own, and thereby have the credible chance for victory. Likewise in this spiritual war, we must put on this armor, which we can equate with putting on the Lord Jesus Christ, and putting on the new man (in Christ) created by God in righteousness and true holiness. Also to shun the old man with his human frailties and repent of all his deeds and deceitful lusts for sin and transgression he is wont to partake of. Thus if one considers that this armor is an allegory of the veritable and actual nature and attributes of Christ Jesus our LORD, “putting on the LORD Jesus Christ” and “put[ting] on the new man” makes perfect sense. Consider how each piece of this armor is named, and you have Jesus Christ and His spiritual integrity, nature and blessings classified in precise terms. The helmet of SALVATION, the breast plate of RIGHTEOUSNESS; the loins gird about with TRUTH, the preparation of the Gospel of PEACE, the shield of FAITH, the Sword of the SPIRIT are all intertwined in the Person of the LORD Jesus Christ! Not for lack of trying, Satan could not find any weaknesses in Jesus Christ; there was nothing to entice Him with, nothing with which he could lure Him into sin and away from the Father’s will. Jesus declared that He always did the Father’s will (JOHN 8:29) and never varied from it; the Father likewise said of the Son, that He is well pleased with Him (see MATT 3:17;17:5). In the reference to JOHN 14:30 the phrase “hath (nothing)” is scheo in the Greek, and can refer to “to hold, directly or remotely, possession, ability, relation or condition”, also its interesting to note that in some applications this word can imply “to reign”. This is in the negative sense, thus Satan has no possession of Jesus Christ, or any relation; he does not reign over Him as he does over sinful mankind as the “god of this world”. It’s this brand of impregnable, spiritual integrity that Christ Jesus bequeaths to us in the form of this spiritual armor, the armor OF GOD, which alone avails in protecting us from the enemy, his attacks, and enables us to venture forth into his territory of the spiritual kingdom of darkness and rescue souls from that devilish domain. Therefore we are well “able to stand against the wiles of the devil”. Three times the word “stand (against)” is used in this portion of scripture (“withstand” is of even greater emphasis in vs. 13; we’ll look at that later), and it’s the same Greek word each time: histemi which means, “stand, establish, stand still, abide, appoint, continue, covenant”. If one does a study of warfare campaigns in the conquest of Canaan as recorded in the Old Testament, particularly in the Pentateuch (first Five Books of Moses) and the book of Joshua, you have models (or examples, ROM 15:4) of spiritual warfare done in the physical domain. Some old hymns refer to crossing the Jordan as leaving this life and entering into heaven; I don’t believe that is the case, not quite. Its more like leaving the old life, and entering into the new: for the Christian this is especially relevant as the new life very much entails struggles and battles in spiritual warfare. We have our giants to slay, just as they had theirs! HAVE YOU SLAIN YOUR GIANT TODAY? Note that this armor in order to be effective must be entire and complete, that is “the whole armor” and not merely several parts! The LORD’s furnishings for us are entire, and not wanting in any regard. His provisions from His eternal storehouses are generous and ample in supply so that no soldier of the Cross can claim inadequacy in Christ or to say that “the enemy is too strong”. If we suffer defeat it is ourselves to blame, and not God. Yet even in defeat, we are not robbed of the opportunity to regain the victory by God’s grace! Our God isn’t a God of second chances, but rather multiple chances for those of a contrite, meek and repentant heart! So, what is it that we must stand against? In this Divine appointment by God (and understand that all of us soldiers are appointed by orders from our Captain to so engage in war at the station of His choosing), all of us saints in this world, which dwell behind ‘enemy lines’ are certainly ‘marked targets.’ What covenant are we agreed to and must abide by? That we STAND, resolutely and aggressively against “the wiles of the devil” and ‘wiles’ is a very telling word! Methodeia – “method, travesty, trickery, wile, to lie in wait. It denotes craft or deceit, a cunning device (plan)”. Note that in this verse, this word is in the plural form. Satan has not merely a single plan to destroy us, but many. If one or a dozen should fail, he has other tactics in his repertoire he may employ for our ruin. Remember that this creature is probably yet the most intelligent and powerful being, second only to God Himself, for this is the one that Ezekiel states was the highest ranking cherub (a super-class of angelic being) in heaven, and appointed (prior to his fall) as perhaps the overseer of all the hosts (armies) of heaven. See EZEK 28:14; for detailed history of Lucifer prior to and during his fall see ISAIAH 14 and EZEK 28. Noah’s ark, which protected its eight passengers from vile humanity which no doubt would crave entrance (though there is no mention of this, its reasonable that faced with drowning, the victims of the Flood would desperately seek refuge there) once they realized judgment had finally come (GEN 7:13-17). Obviously the ark protected its passengers from the judgment of God’s Flood as well. Moses had a cleft in the Rock which protected him from being destroyed by the glorious presence of God Himself (EXOD 33:18-23). There are a few different Hebrew words used for “refuge” particularly in the Psalms, and they are as follows: misgab, machaceh, manowc, and chacah. And then we have the armor of God which the Christian warrior is to abide in; just as one inhabits a strong tower, a refuge, or dwells within a hedge, so also must we ‘inhabit’ this armor and the nature of its parts must be apprehended into the Christian’s life. We are about to get into all of this, starting with verse 14, however there is still vs. 12 and 13 to ponder. Were we to wrestle with flesh and blood, physical enemies that could be seen with our natural eyes, we would be far more aware of them and on a more urgent alert whenever they came around. However, this is obviously not the case. Our enemies are spiritual in nature, thus invisible to the natural eye, and when they attack, we are inclined to not acknowledge them as the source, but rather natural sources, usually in the form of other people (which could indeed be used as agencies of evil, inspired by these invisible enemies) or even natural causes, such as weather, or sicknesses of various kinds, or accidents, etc. We cannot afford to become abnormally fixated on spiritual darkness, and attribute every misfortune or sorrow to them (some of these are orchestrated by God, for His own purposes), but we must also be keenly aware and discerning that these angelic agencies of the fallen sort are truly all around us, are working against us, and as long as our attention is focused upon the natural realm, they can find an advantage over us in such a vulnerable state of ignorance. I find it fascinating that these magistrates were nine in number, because since Paul used this word “arche” being the general term, or “archon” specifically referring to these rulers of Athens – in reference to these “principalities” found here in EPHESIANS 6:12, these likewise would then presumably be nine in number, that is nine chief angelic rulers in the kingdom of darkness. “One definition of an ascended master is an individual who has undergone the process of ascension. Throughout history, there have been stories of these individuals who have reached a higher state of spiritual awareness and placed themselves in service to humanity. One concept of an ascended master derives from the teachings of Theosophy. “In Theosophy, and various [derivatives] and offshoots of theosophy, ascended masters are a group of spiritually enlightened beings, once mere mortals, who have undergone a process of spiritual transformation. According to these teachings, they remain attentive to the spiritual needs of humanity, and act as superintendents of its spiritual growth. In this, they can be compared to the Great White Brotherhood or Secret Chiefs who are posited by various magical organizations; and more remotely, to the bodhisattvas of Buddhism, or the saints of Catholic and Orthodox Christianity. “The term may actually have originated with Edward Bulwer-Lytton, who in his satirical book The Coming Race posited the existence of "Nine Unknown Men" who secretly run things in the world.” (Taken from - RUMORS OF THE NINE and WHO THEY ARE). On a peripheral note I conjecture that these Nine Angelic Overlords directly under Lucifer embody, probably temporarily, these nine ‘unknown’ men who are used as conduits to express the will of Lucifer, the god of this world, but that is only my opinion that perhaps warrants some merit. These are the paramount of evil with which we contend (excluding Satan himself) and wrestle. The word, “wrestle” or pallo in the Greek, in vs. 12 refers to “wrestling, to sway, to vibrate” connected with “esti” which typically refers to a third person singular, present tense, most commonly used with the word “wrestle”. This is a great struggle that requires concerted effort; a contest not easily won, for our adversary is tenacious and proud, and shall refuse to relent willingly. “. . . against principalities, against powers . . .”. Exousia in the Greek, means, “force, magistrate, superhuman, potentate, delegated authority, jurisdiction; the power of rule or government,” it’s the same word used in EPHESIANS 1:21 and EPHESIANS 2: 2 where there as well it refers to spiritual powers but in 2:2 specifies satanic power, that is, “the prince of the power of the air”. As part of the definitive rendering of this word involves jurisdiction, there may be some justification that these powers have jurisdictional territories over which they preside (see DAN 10:13–20)*. However as is often the case with certain churches, extra-biblical beliefs are taught that these jurisdictional powers all have names and by knowing the names of these powers, the Christian can effectively ‘bind’ them, then lay claim to the souls in that jurisdiction for Christ. In order to arrive at such conclusions one must take various scriptures out of context, misconstrue their meaning, and resort to other non-biblical texts in order to learn the supposed names of these powers (MATT 12:29 and MARK 3:27 are used, but no where are territories or names required in order to ‘bind’ and in no instance are cities, or areas taken back, but in this case, a single demoniac). These practices are not taught by the LORD Jesus Christ (on one occasion only He demanded the name of the demon (Legion) as found in LUKE 8:30), nor are there any doctrinal teachings found anywhere in the epistles on this and must therefore be rejected as legitimate material for learning about spiritual warfare. “Darkness” in this passage of Ephesians has the same Greek word as used almost everywhere else in the New Testament, and other passages use similar, related Greek words, except in two places; once in 2 PET 2:4 and once in JUDE 1:6. In both instances it refers to the “[everlasting] chains of darkness” in which certain fallen angels are held captive for desperately wicked acts (many scholars believe those to be documented in GEN 6 in regards to fallen angels “the sons of God [or ‘bene ha Eloheim’] cohabitating with human females, resulting in a hybrid species known as ‘the fallen ones’ or nephilim.). Here in EPH 6:12 the word ‘darkness’ is skotos, meaning, “obscurity, shadiness, and mostly, darkness; the exact opposite of light (phos); physical darkness, intellectual darkness, blindness, the place of punishment, moral and spiritual darkness, evil works, of evil powers that dominate the world”, and this last definition best suits the passage in question. Poneria is here employed for “wickedness” and it means, “the active exercise of a vicious disposition.” The Greek word, kakia is defined as having “a vicious disposition” only, but poneria has the added dimension of active exercise, that is, being involved in wickedness in a vicious manner. The first heaven would be the atmospheric realm that encompasses our planet; the second would be the celestial realm of outer space, and the third heaven that region of spiritual reality in which angels both holy and evil traffic and its uppermost regions being that place of the abode of the Most High and Holy God (see ISAIAH 57:15; 63:15; PSALM 33:13-14; 61:4; 65:4)! So we see that we have an invisible enemy, highly organized and dominating every area of this world, with abilities that go well beyond the physical dimensions we reside in, and have the intent of our total spiritual ruin or at the least, our spiritual nullification. By their sheer numbers they can incorporate a nearly flawless imitation of omniscience (all knowing) and omnipresence (all present; acting in concert with one another) and have such power and ability that would render any sinner entirely helpless and unable to resist. Note precisely what the prophet said to his servant; not: “they that be with us are more then they” but rather, “they that be with us (God’s mighty angelic hosts) are more than they that be with them (the Syrian army). So who are the “they” that were with the Syrian army? I believe it was the counterpart to God’s heavenly army, that is, the satanic forces behind the pagan powers of Syria. Still, those that are with us are MORE than they that are with the worldly systems of evil! On that sobering note, this concludes the third segment of this article; may the LORD bless us as we seek His face and by holy endeavor lay hold of the Word of Truth, both in understanding and in obedience! May we stand fast in our confrontation of evil and by the grace of God, overcome it in the Most Holy, Almighty name of the LORD Jesus Christ! Great article brother and thank you for sharing. Very timely for the wife and I as we are currently overseas. Very encouraging to keep our eyes on the One Whom defeats all. I do have one question if you could elaborate a small bit on the demons being nearly all knowing? Greetings "Gospel1Cor15" (http://www.blogger.com/profile/10586790190193489981)! The fallen angels led by Satan are spiritual creatures, which means that they are not confined to the physical domain, at least not in the same way that we flesh and blood creatures are. They may be able to move at speeds beyond our comprehension and have certainly existed for the thousands of years of our physical history and perhaps even long before that. They are no doubt full of information and knowledge, having these several millennia to compile such, with memories that are potentially flawless. If one considers that vast collective of demonic power with the knowledge it has amassed and an ability to navigate at such speeds - they could probably create the false impression of omniscience (all knowing) and omnipresence (all present) without actually possessing these qualities. As always, Satan is a liar and a deceiver and would do all that he can to perpetuate such deceptions in order to demoralize the saints, misleading them into thinking he is actually more powerful than he really is. I hope this clarifies the matter for you?